Lanzarote is an island of extraordinary beauty and spectacular contrasts; a place of black deserts and white houses; limpid lagoons and rolling surf; soaring volcanoes and sweeping sandy beaches. It’s bleak and beautiful, stark and stunning. Unlike its bigger, brasher neighbours to the west – Tenerife and Grand Canaria – Lanzarote has refrained from selling out to stack-‘em-high-sell-‘em-cheap package holidays and favoured a more sustainable, intimate brand of tourism. 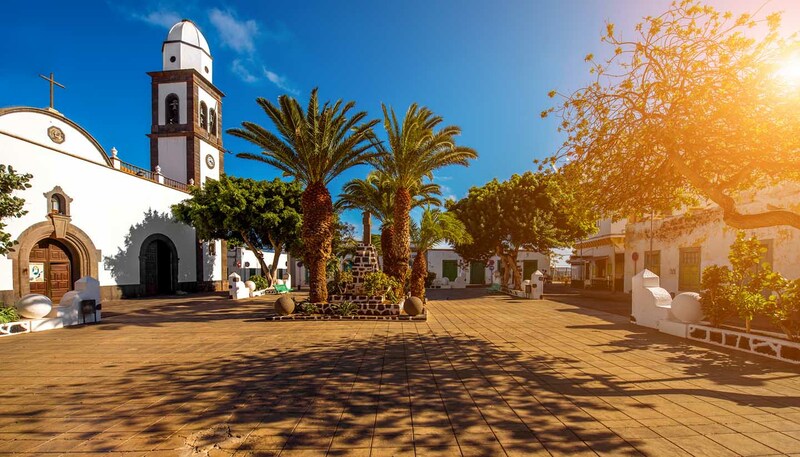 It’s not devoid of big resorts and bustling beaches – with 300 days of sunshine annually the island has an obvious appeal amongst sun-seeking Europeans – but, despite this, Lanzarote has retained a traditional charm and authentic aesthetic that many find lacking elsewhere on the Canary archipelago. This is thanks largely to César Manrique, the late, great artist and architect who turned Lanzarote and its people onto the merits of sustainable development. Manrique is behind some of the island’s most revered attractions; from urban murals and intriguing art installations to cosy cave bars and verdant cactus gardens. Manrique’s legacy, not to mention Lanzarote’s stunning scenery, remain a big draw for travelling artists, who come from all over the world to visit the island. They tackle the local landscapes rather differently to the many sports enthusiasts, who come to test their mettle in what is considered to be one of Europe’s top outdoor destinations. It’s easy to see why Lanzarote has gained such a reputation; the island’s smooth, straight roads are a veritable paradise for cyclers, while its dried lava fields and lofty hiking trails offer perfect conditions for runners and ramblers. Of course, there's plenty of sand, sea and Sangria for those who want it, but ultimately, for most visitors, Lanzarote’s appeal lies not in its opportunities for boozy beach holidays, but in its untamed natural beauty, traditional charm and strong artistic heritage, which lure many back for repeat visits. 846 sq km (327 sq miles).